The present church is mainly of the 14th century and largely as built although Street’s restoration 1879-1887 made significant changes to the interior. It is certain an even earlier building stood here and that the present Tower is a survivor. Little was done to the church over the following 100 years but over the past 20 years the Lady Chapel has been restored as a particular place of prayer and contemplation, the back areas of the Church cleared and made into an open space for a small crèche and children’s area. A kitchen established for social purposes and most recent of all the church porch restored to house a number of repaired benefactors boards with new glass and wooden doors replacing the old and very draughty open metal doors. In the porch is an oak chest under the stair case. Although it may look like something out of a dracula movie, its real purpose is not quite as interesting but the workmanship, however, really is. We believe it was used as an early safe, it had three locks on the front and it is believed the Vicar and the Churchwardens each had keys and all three would be needed to open it. It is considered to be one of the earliest and best preserved of its type in the area. Not only is it bound with iron strips but its constructed from a single log and is fantastically heavy. 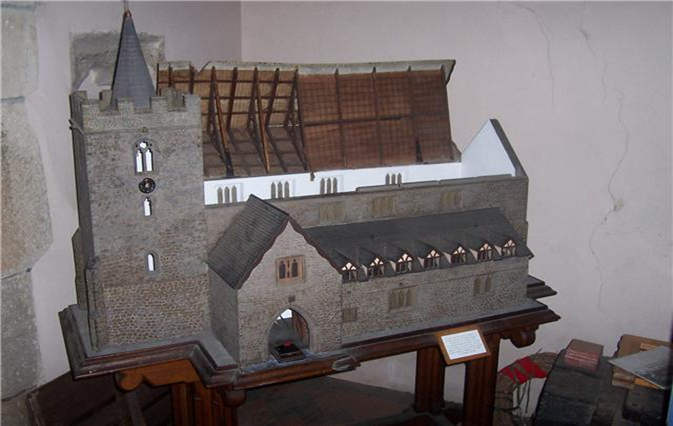 Also in the porch is a model of the church, which shows the way it was before the restoration work of 1879. The carvings to either side of the main altar, known as Reredos, are dated to the late 19th century and depict the four great prophets and the four great fathers of the church. Above the altar is the East window, which was placed in 1891 by Mrs Curling in memory of her husband, William, and depicts Christ at the five pivotal moments of his life. Perhaps most striking is the roof, not only is it very high but it’s 25 feet across and, unusually, for 14th-century design, completely unsupported. 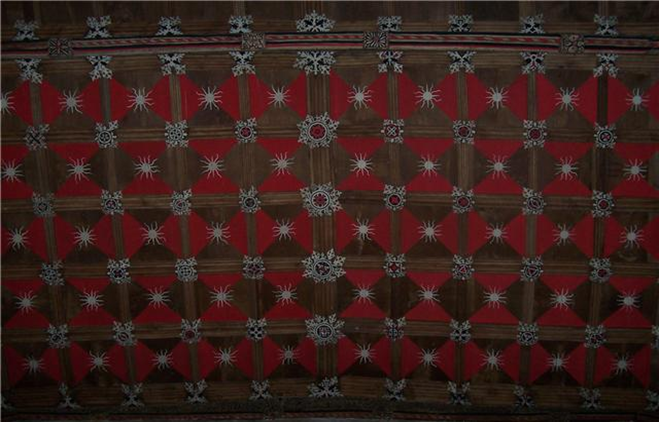 The panelled ceiling over the chancel is of a typical Tudor design but rather impressively decorated, featuring around 140 bosses altogether of 120 different designs. It has recently been lit so that it can be fully appreciated.